Paint any room with light. 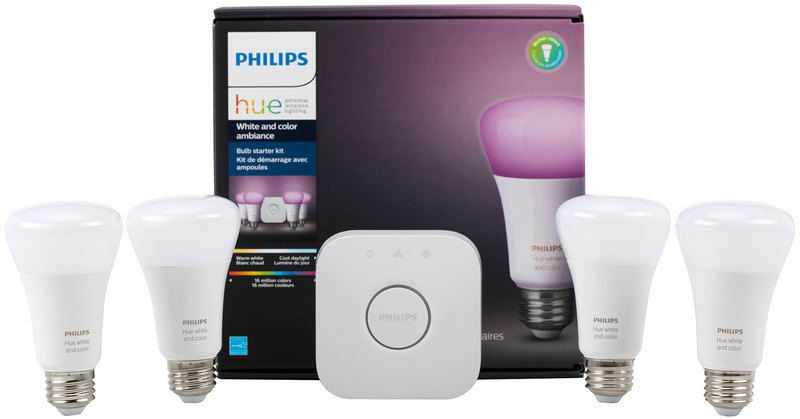 Everything you need to experience the ambience of Philips Hue lighting throughout your home. Extend your TV viewing experience to the whole room or take your gaming experience to the next level with light synchronization. Transform any room into a dance floor by syncing light to your favourite songs so you can enjoy every beat to the fullest. Light influences our mood, behavior, alertness and routine. Customize your lighting so it is optimal for each moment in your day. Feel as though you are waking up to sunlight with gradually increasing light intensity. Schedule times for your lights to come on and off. If you’re away on vacation, make it seem like you’re home when you’re not. Instantly change your room with our recommended color palette. Use one of the present scenes or let your creativity run free and create your own. Thanks to intelligent scene setting, the app extracts the color palette from any picture and creates a vibrant mood.